Be the first to share your favorite memory, photo or story of Mondo. This memorial page is dedicated for family, friends and future generations to celebrate the life of their loved one. 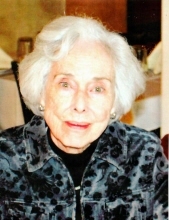 Mondo Robinson, age 94, was a resident of Holiday Hills, formerly of Naperville, IL. Mondo was the beloved wife of the late William Sr.; loving mother of Adrien (Valerie Machalski) and the late Deamonda and William Jr.; cherished grandma of Lindsey and William; proud great grandma of Gabriella and Michael; dear sister of Kathrine, Constantine, Elizabeth (Nicholas) and the late William, George, Annastasia, Christina and Mary. Mondo was born December 13, 1924 in East St. Louis, IL and passed away Saturday, April 6, 2019 at home. Visitation will be Thursday, April 11, 2019, from 10:00 am to time of prayers at 10:45 am at St. Sava Serbian Orthodox Church 32377 IL-21, Libertyville, IL 60048 (847-362-2440), Orthodox Funeral Service at 11:00 AM. Interment will follow at Ascension Cemetery. In lieu of flowers, memorials are appreciated to St. Jude Children’s Research Hospital, www.stjude.org. "Email Address" would like to share the life celebration of Mondo Robinson. Click on the "link" to go to share a favorite memory or leave a condolence message for the family.